Dr. Oz invited Ayurveda experts to share with the audience how to lose weight and improve their health. Three guests who tried them lost 56 pounds effortlessly using these methods! Dr. Oz shared ancient secrets unlike anything you have ever tried. No diet or exercise is needed to shed the pounds! 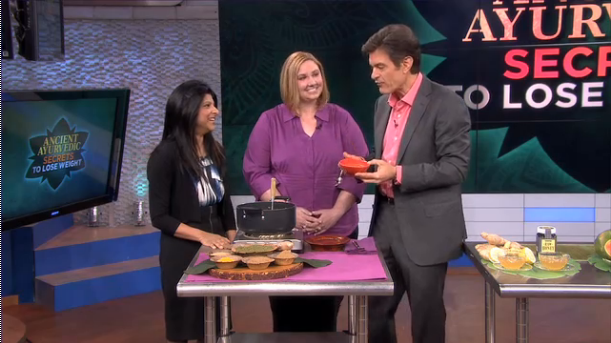 Here is a preview to the Friday, May 11, 2012 Dr. Oz Show on Ancient Ayurvedic Secrets to Lose Weight. Dr. Oz tastes a simple food to help with weight loss: spiced mung bean soup. One Ayurveda expert, Sunita Mohan, explained the six tastes, shared knowledge of various spices and their beneficial effects, and recipes to help you eat healthy and lose weight! Links to segments provided below. Another Ayurveda expert invited to participate in the show was Candace Badgett, owner of The Raj, an authentic award-winning Ayurvedic health spa located in Maharishi Vedic City, Iowa. 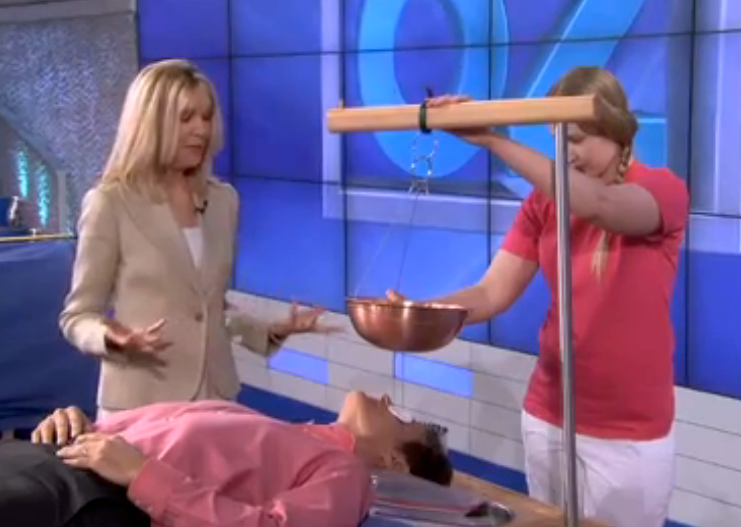 Candace discussed traditional Ayurvedic approaches to losing weight by demonstrating certain procedures on selected audience members, including Dr. Oz. These treatments are known to improve digestion, remove toxins, nourish the tissues, and reduce stress, which disrupts normal bodily functions causing weight gain. Here are pictures of Amy, Katy, and Dr. Oz receiving Udvartana, Swedana, and Shirodhara, respectively. Candace explains that a Vata imbalance is almost always at the root of excess weight. She recommended mixing chickpea flour with herbalized Vata oil to the consistency of peanut butter and applying it as a friction massage, which heats the tissues and removes the appearance of cellulite. 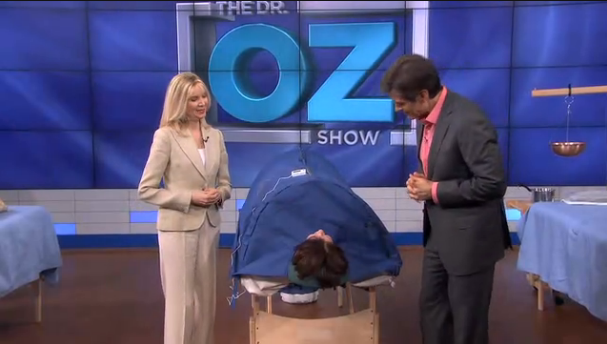 Candace and Dr. Oz discuss the recipe for Udvartana as Amy receives the treatment. Candace Badgett describes Shirodhara as a stream of herbalized warm oil rhythmically poured back and forth across the forehead. This treatment deeply relaxes the mind and body powerfully removing stress and fatigue. It also enlivens the happiness hormones. Watch this second video on the Ayurvedic Treatments to Slim Down segment posted on the Dr. Oz Show website. Click the link to see all the excerpts from this show: http://www.doctoroz.com/episode/ancient-ayurvedic-secrets-lose-weight. Read more about The Raj Weight-Loss Program, and other programs, at the Maharishi Ayurveda Health Spa website: www.theraj.com. Also see Dr. Oz on Transcendental Meditation and Dr Oz’s gift of TM to his employees resulted in personal and corporate benefits — see the video and Some Reports on Dr. Oz’s Interview with Oprah about TM and her Next Chapter. This entry was posted on May 15, 2012 at 9:05 pm and is filed under Education, Health, Videos. You can follow any responses to this entry through the RSS 2.0 feed. You can leave a response, or trackback from your own site.